Gill Holland, co-owner of The Green Building at 732 E. Market St. in Louisville’s NuLu District, wants to establish Louisville as the “Gateway to Bourbon Country.” And now a new bike rack sculpture in front of the building is pointing the way. 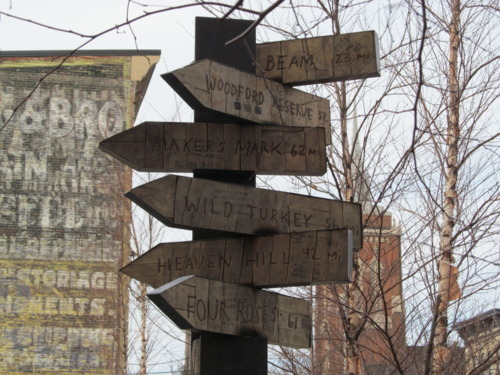 The bourbon-themed sculpture, designed by artist Jacob Heustis and dubbed “As the Old Crow Flies,” shows the actual direction and distance of each of the six distilleries on the Kentucky Bourbon Trail: Four Roses, Heaven Hill, Jim Beam, Marker’s Mark, Wild Turkey and Woodford Reserve. Heustis built the piece from wood and steel from barrels sourced from the distilleries and burned the names onto each sign. The sculpture was dedicated on Jan. 6 during the First Friday Trolley Hop with several master distillers in attendance.